My husband and I had been gifted these second hand sofas ( 3 seater+two seater) a couple of months back. Thanks to these that we had some seating in our living room. They actually made it look like a living room, cause there was hardly any other furniture there! However these sofas were partly covered in a dirty brown stripy velvet cloth and partly in rexin( a commonly used alternative to leather). We had many guests who liked them as well. But not me. The velvet would catch dust and hug it tight. We looked at some options of buying new seating, but it was all costing Rs.60,000 and above from stores like fabindia. For a newly married penny saving couple like us it was an absolute no-no. Here are some pictures of the insides of the sofa. They look like cheap quality wood simply nailed together like it is in a mango crate. Thankfully the frame was quite strong and the springs were also good. Nowadays the fluffier the sofa you buy, weaker is the wood used in making the insides. My neighbour got this whole set of multi luxurious,layered, mega fluffy sofa from Rawat 6 years back which at that time was sold to them as pine wood. The sides of it broke recently and believe me it was a sorry picture of some baggase based board staring into our faces. Im sure there is another side to this story which I havent heard. 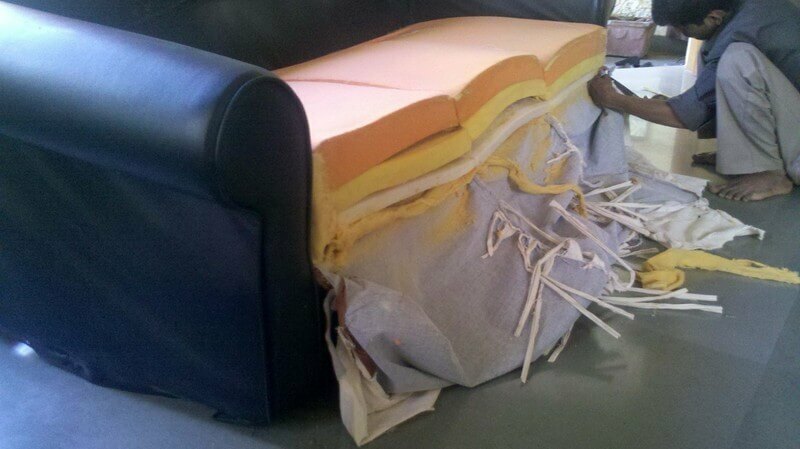 Nevertheless it is better to be careful about quality when buying furniture.